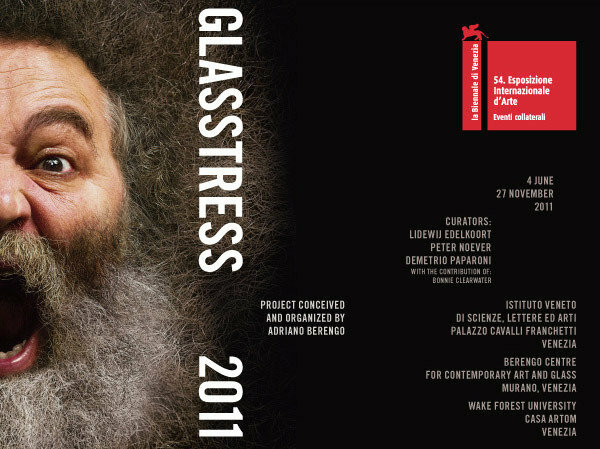 On June 4, 2011 in Venice, the second edition of Glasstress, the contemporary art exhibition in which important stars on the international scene match their talents with the use of glass, opened to the public. The exhibition was held at Palazzo Franchetti (seat of the Istituto Veneto di Scienze, Lettere ed Arti), the Berengo Centre for Contemporary Art and Glass and included a special installation at the Wake Forest University, Casa Artom. Promoted by The Museum of Arts and Design (MAD) of New York, conceived and organized by Adriano Berengo and produced by Venice Projects, Glasstress 2011 was curated by an international cadre of renowned curators, Lidewij Edelkoort, Peter Noever and Demetrio Paparoni, with a contribution of Bonnie Clearwater. Glasstress 2011 exhibited sculptures and installations of glassworks created by internationally recognized contemporary artists and designers: Anthon Beeke, Pieke Bergmans, Domenico Bianchi, Ernst Billgren, Joost van Bleiswijk, Barbara Bloom, Monica Bonvicini, 5.5 Designers, Kiki van Eijk, Jan Fabre, Kendell Geers, Charlotte Gyllenhammar, Zaha Hadid, Paula Hayes, Jaime Hayon, Yuichi Higashionna, Magdalena Jetelova, Liu Jianhua, Michael Joo, Marya Kazoun, Konstantin Khudyakov, Michael Kienzer, Marta Klonowska, Nawa Kohei, Oleg Kulik, Hitoshi Kuriyama, Hye Rim Lee, Tomáš Libertiny, Atelier Van Lieshout, Luke Jerram, Massimo Lunardon, Urs Luthi, Vik Muniz, Nabil Nahas, Atelier Ted Noten, Tony Oursler, Anne Peabody, Javier Pérez, Jaume Plensa, Recycle Group, Antje Rieck, Antonio Riello, Bernardì Roig, Maria Roosen, Ursula von Rydingsvard, Andrea Salvador, Judith Schaechter, Thomas Schütte, Anatoly Shuravlev, Kiki Smith, Mike + Doug Starn, Tanja Sæter, Patricia Urquiola, Pharrell Williams, Koen Vanmechelen, Fred Wilson, Erwin Wurm, Shi Yong, Tokujin Yoshioka, Yutaka Sone, Zhang Huan. The show also included special projects: the site-specific indoor and outdoor installations with Kendell Geers, Zaha Hadid, Magdalena Jetelova, Michael Kienzer, Koen Vanmechelen and Erwin Wurm, curated by Peter Noever; the site-specific installation with Tony Oursler, curated by Demetrio Paparoni and Gianni Mercurio; and special project by Mike + Doug Starn. The theme of the exhibition was the complex relationship that ties art, design and architecture together in an age thought to have moved beyond modernism. Comparing the opinions of various curators, Glasstress addresses this issue through glass sculptures specially made by major artists on the contemporary scene and through objects and sculptures made by designers, whose research was influenced by the formal aspect of the use of the object. Putting glassworks that respond to such profoundly different concepts next to each other in the same show is the equivalent of reviving critical issues that are far from resolved: What makes an object that is formally conditioned by its function a work of art? To respond to the spirit of the time, must a work refer only to itself? Can we say today that the function of a design object is itself enough to make the work alien to the spirit of the time regardless of its formal qualities? These questions, which were the basis of the 2011 Glasstress project, called into question the notion of “art for art’s sake” so dear to the 20th century avant-gardes. Glasstress 2011 offered the viewer food for thought about complex themes. It poses the need for a critical reassessment of the main tenets of modernism, the majority of which were still very much present in the art of the eighties and questioned in the next decade by the second generation of post-modernism. Glasstress 2011 demonstrated just how topical these themes still are and the need to explore them further. The exhibition, stretching the boundaries between artistic endeavors, presented a sound project created specifically for Glasstress 2011 by Max Casacci, musician, producer and founder of Subsonica, and Vaghe Stelle, an electronic music producer and composer. Their work, between abstraction and harmonic construction, is inspired by the sounds of glass and the furnace.